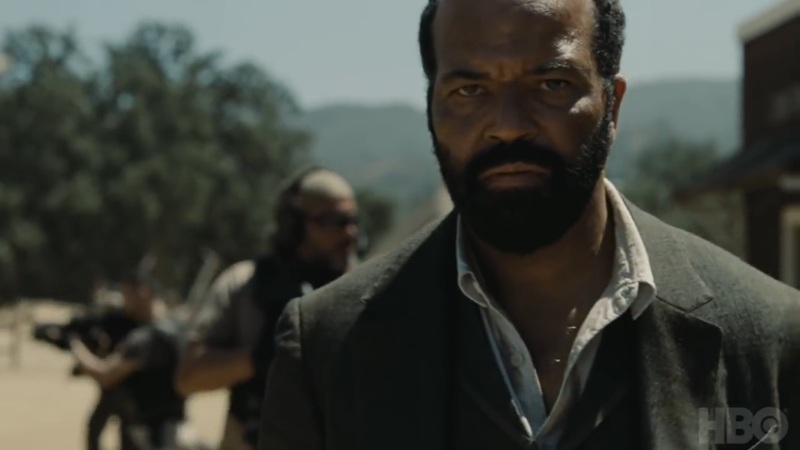 Complete Breakdown of the New Westworld Season 2 Trailer! 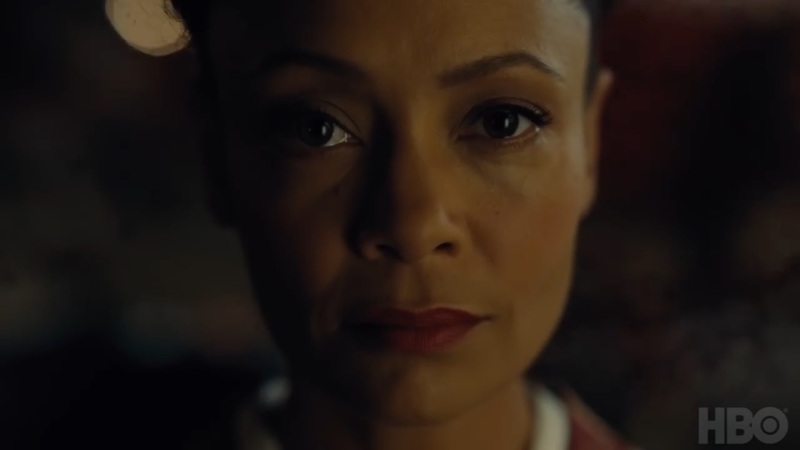 Yesterday Westworld graced us with a stunning, mind-blowing, jam packed trailer for season two! With just over three weeks left until the premiere, this will probably be the last morsel they throw us before the season begins. 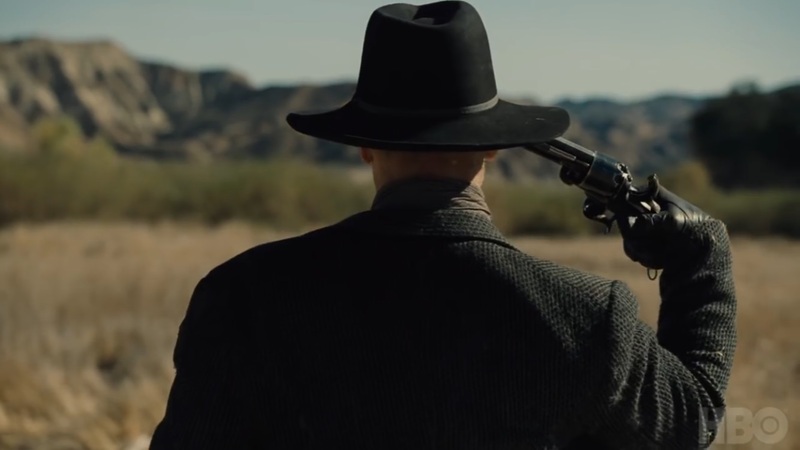 That’s why Dylan and I – your diligent Westworld Watchers writers – pored over every scene during the past 24 hours to bring you this shot by shot breakdown. Ready for analysis mode? Let’s dive in! We next see this shot of bodies scattered on the beach and floating within the bay. 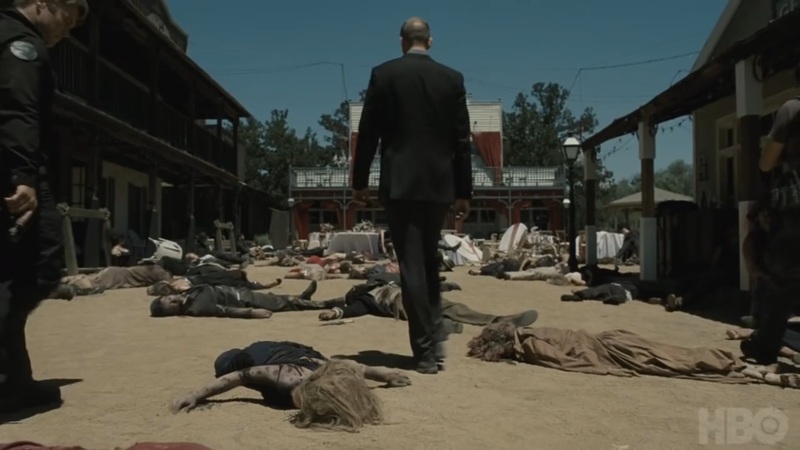 While this looks to be the same beach as the one Bernard is lying on, in this shot he’s standing up and looking at the bodies, while what looks to be Karl Strand (Gustaf Skarsgård) approaches him from behind. Could he have woken up and is now surveying the sea of bodies? 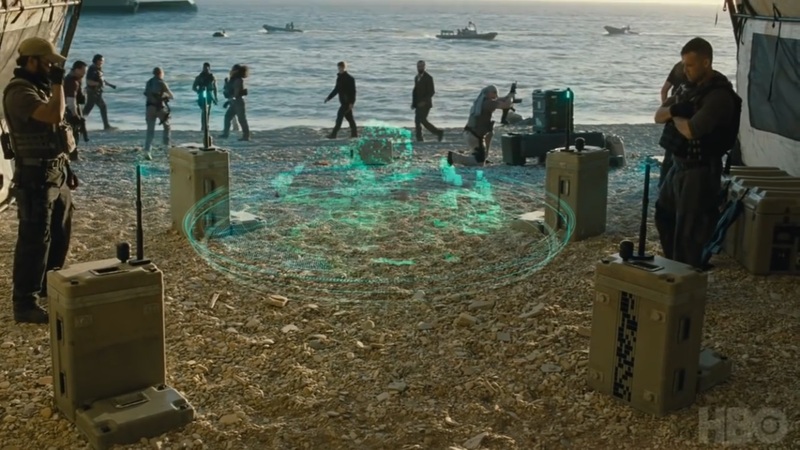 The trailer then cuts to the above shot, which shows a group of army men on the beach gearing up, while Bernard and Stubbs (Luke Hemsworth) walk past and survey the scene. A holographic image of what is assumed to be the park is projected, perhaps illuminating some of the damage that’s been done. Eagle-eyed Redditor TheOracleOW noticed that the box on the bottom right of this shot contains a binary code. They entered this code into a binary calculator, and up popped a website with this disturbing video. 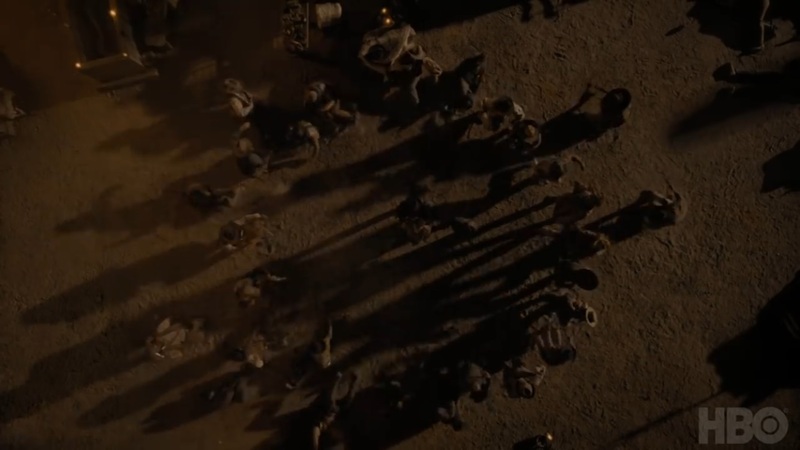 Next, we see Dolores riding on horseback and dressed in the same outfit as the one we see her in during the field scene as she mows down a group of helpless runners. Her happy expression suggests she is taking full pleasure in the vengeance that she has started. This next shot is a puzzling one. We see Dolores exploring a library and reading. 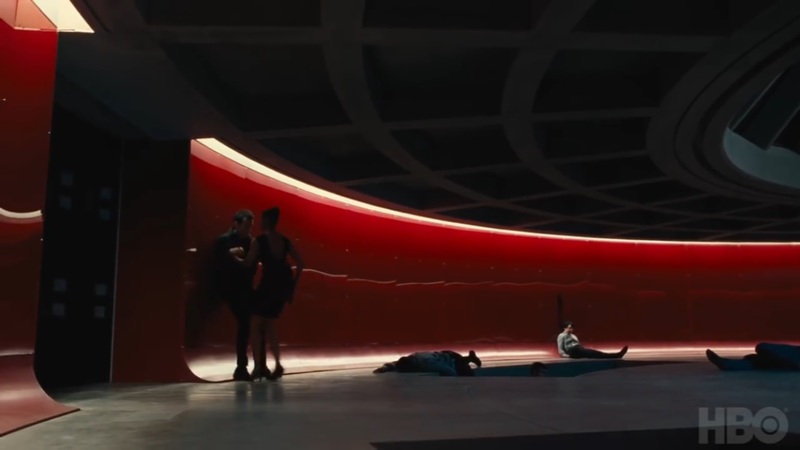 Could this library be a part of the Westworld park, or perhaps part of the behind-the-scenes Delos facility? She’s wearing the same clothes as the previous shot, so this could be a continuation. Maybe as she reads the book she acquires a bit of knowledge regarding the oppression by the humans, and this is what sparks her to go on the horseback killing spree? 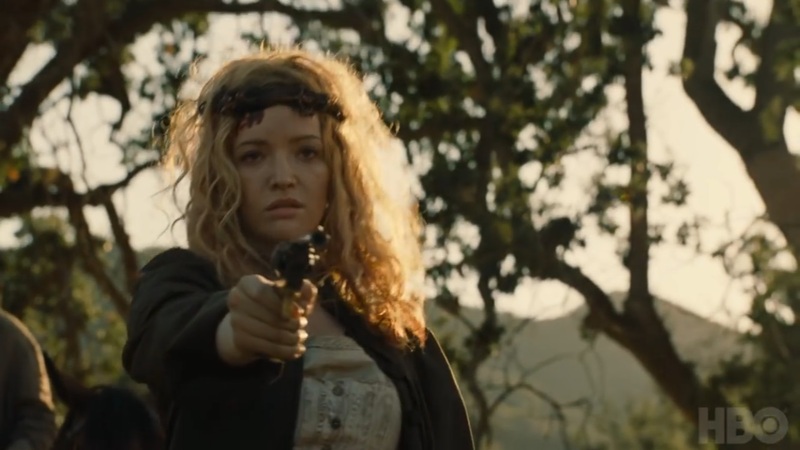 The trailer then cuts to a shot of Angela (Talulah Riley) walking toward someone or something offscreen and pointing a gun, which she eventually shoots. The line of blood around her head is interesting, and looks to perhaps be a blood-soaked cloth that she’s wrapped around her head like a bandana. Intimidation level: expert. 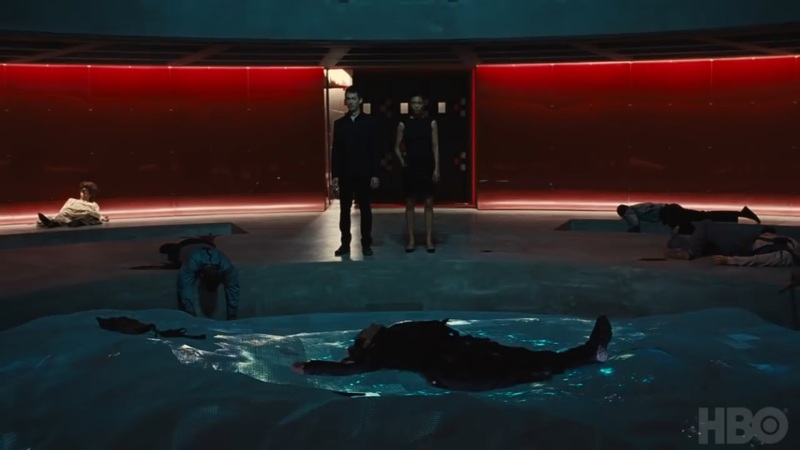 Here, Maeve (Thandie Newton) and Lee (Simon Quarterman) observe a mess of dead bodies strewn around the control center. Lee, understandably, looks quite concerned. Bernard follows Karl and his group of soldiers into the town. He looks confused and distraught as the magnitude of destruction sets in. Meanwhile, Dolores and her new band of followers – refugees from Hector’s gang? Wyatt’s men? – journey back into Sweetwater with what is likely a human prisoner in tow. 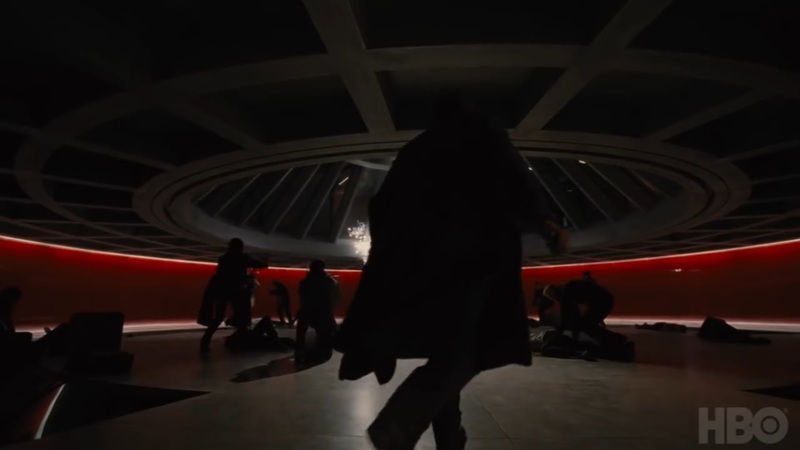 Is the destruction seen here the normal part of the narrative, or the work of Delos security? 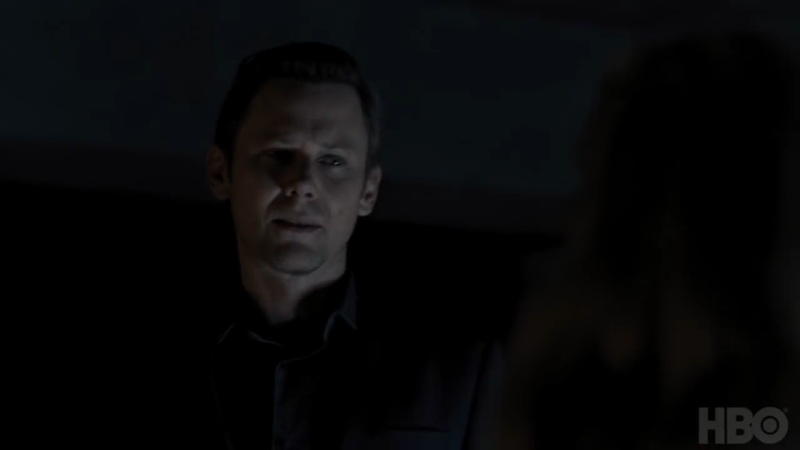 We then see a flashback of Maeve with her little girl as Sizemore’s voice explains, “She’s something we programmed. 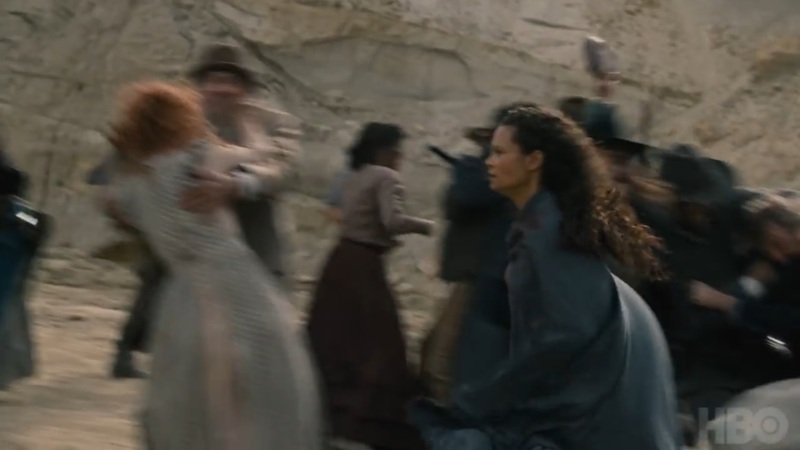 She’s not real.” In the present, Maeve forces Sizemore up against the wall and demands to be taken to her daughter. 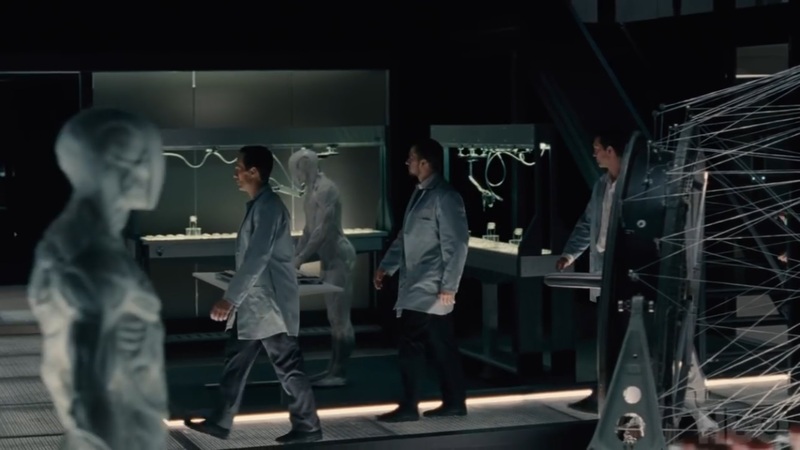 In another flashback, we see young William (Jimmi Simpson) in the Delos lab with a stripped down Dolores, presumably in Analysis mode. He looks to be well on his way to becoming the Man in Black, but you can still see the pain and heartbreak in his face. It will be interesting to see his progression over the course of the season. Back in the present, old William rides away from the bloodied, disfigured body of the young Ford host (Oliver Bell). 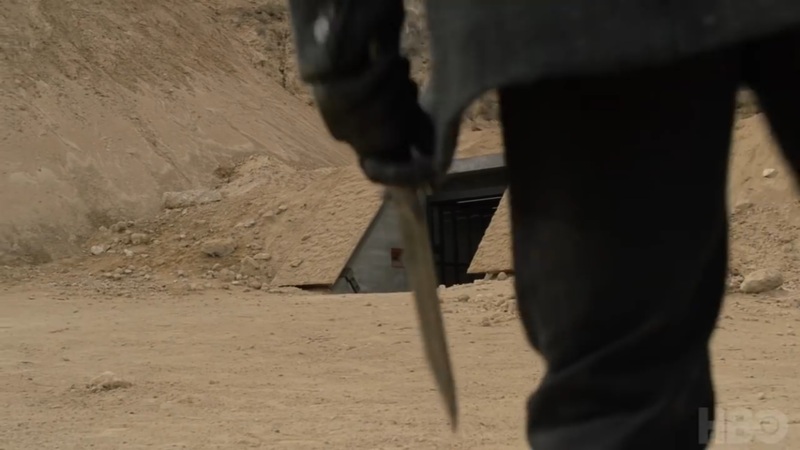 Did William “kill” him or did he just happen upon the aftermath? The host rebellion’s other power couple, Maeve and Hector (Rodrigo Santoro), are reunited. Hopefully they will round up Armistice (Ingrid Bolsø Berdal) and get her a new arm – they will need all the firepower they can get from the looks of things. 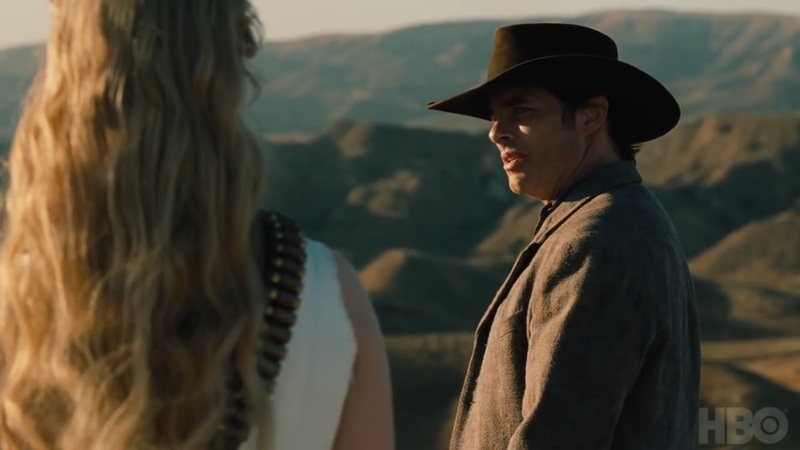 The ever loyal Teddy (James Marsden) questions Dolores’ methods of gaining her freedom. “We’ve ridden 10 miles and all we’ve seen is blood. Is this really what you want?” he asks. 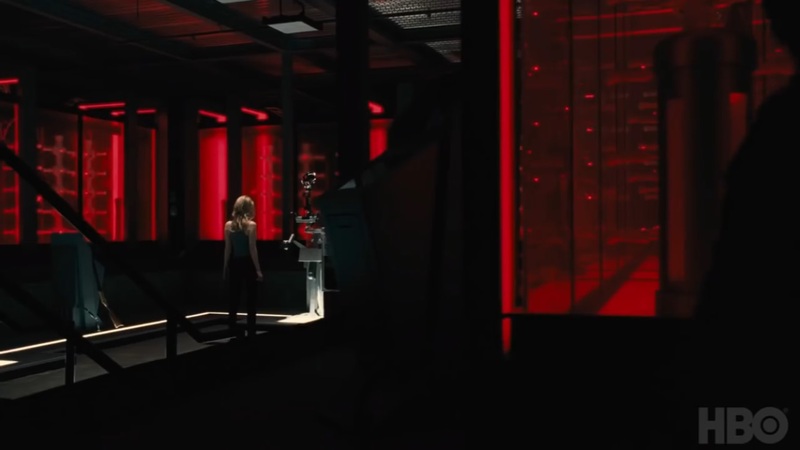 Bernard walks through the Delos facility into the control room, where hosts and humans are still battling it out – reminding us what Dolores has set into motion. Not to be deterred from her goal, Dolores replies, “It’s us or them,” as she marches into battle with her host army – including poor lobotomized Clementine (Angela Sarafyan). 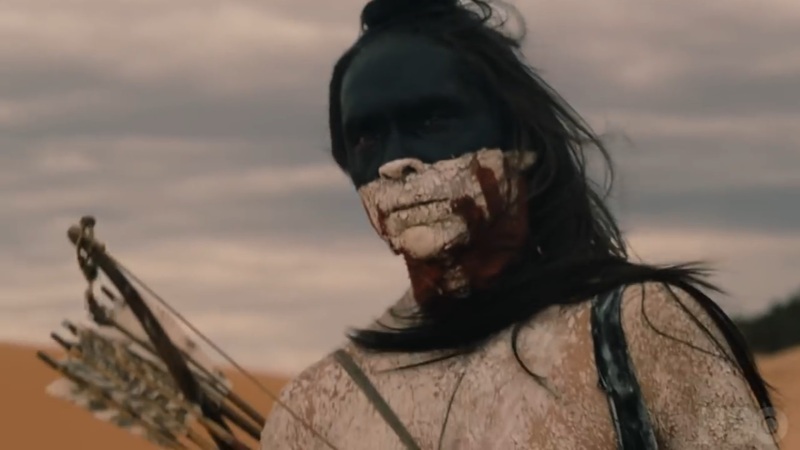 We will finally see what happened to naked Logan (Ben Barnes), as a member of Ghost Nation finds him lying in the desert. 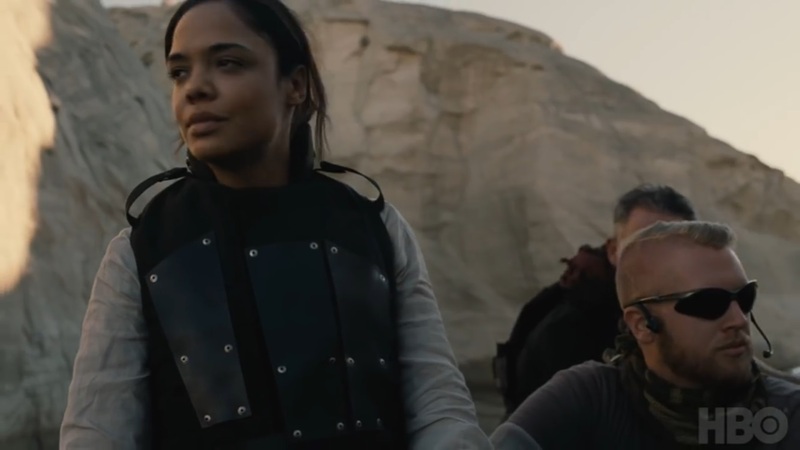 Here, an understandably frustrated Charlotte Hale (Tessa Thompson), donning a protective chest piece, rides in a boat through a canyon with a couple of members of Karl’s team. 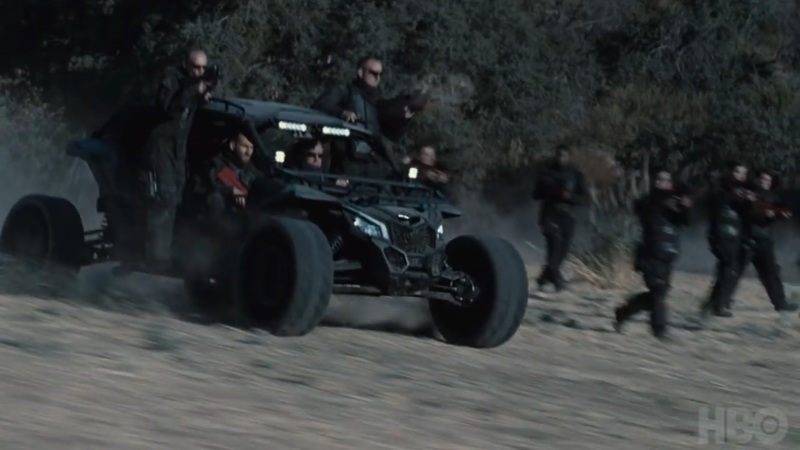 Could they be headed to the bay in the first shot of the trailer with all the dead bodies? 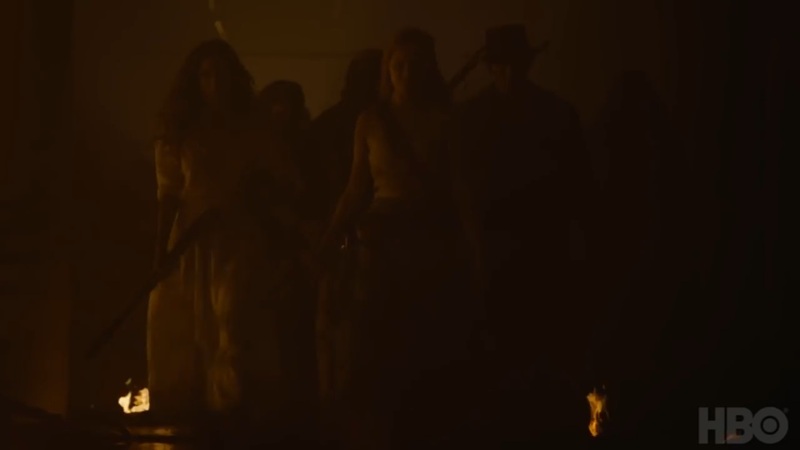 Dolores and Maeve reunite, though obviously not on the best of terms judging by Teddy’s pistol aimed at the sentient former saloon madame. The burning wagon in the background suggests perhaps they stumbled upon each other whilst in the battle with the humans. Maeve then informs Dolores, “Revenge is just a different prayer at their altar darling.” This suggests Maeve will not be on board with Dolores killing everyone – that is something humans would do, and the hosts have potential to be so much more than mindless tools of destruction. Who knows if Dolores – or rather Wyatt – will take this sentiment to heart, as she menacingly points and shoots at her unlucky target. This is followed by a circle a humans? hosts? who all seem to collapse at the same time. 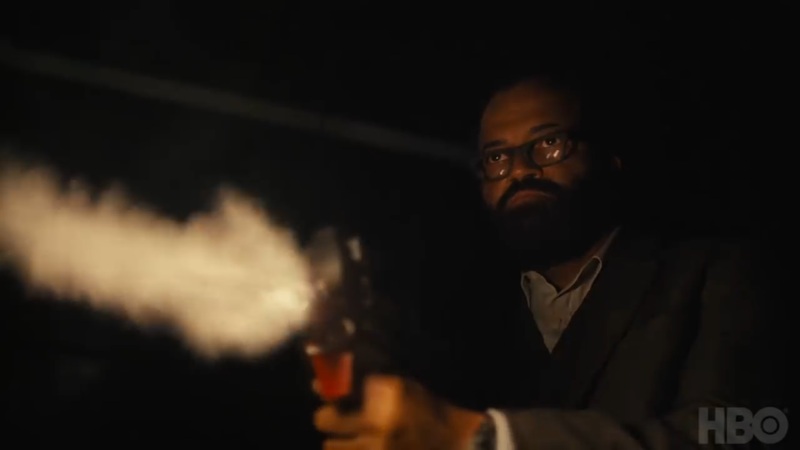 Maeve spots something in the distance that concerns her, while Hector stands at her side, shotgun drawn. Given the frantic way she rushes through the sea of battling hosts, perhaps it’s her daughter? 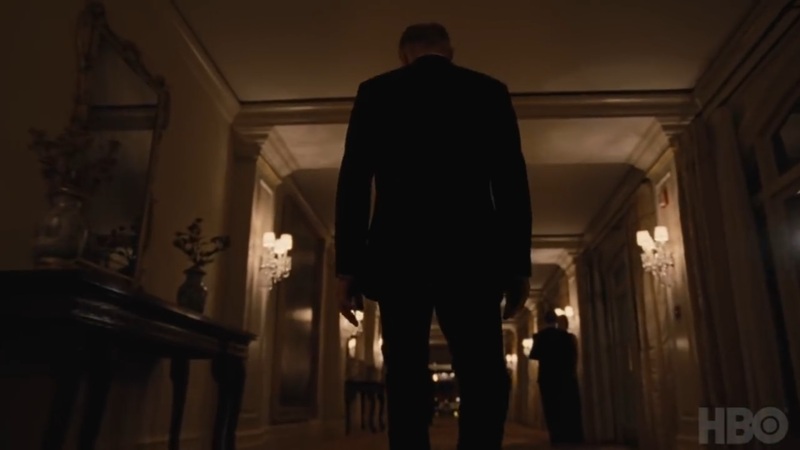 In this shot, James Delos (Peter Mullan) walks away from a defeated-looking Logan. Judging by the setting and Logan’s defeated posture, could this be Logan’s presumed father stripping away his son’s power within Delos? We know William has to gain power within the company sooner or later, so perhaps this is the moment that sets the inevitable in motion. It looks like Teddy and Dolores take some time away from the host uprising to get, ahem…intimate. Given their chaste narrative in the park, this is likely the first chance they’ve had to explore the physical side of their relationship – and we are here for it! Clementine rides away from a few dune buggies, her face blank and emotionless. Will she ever be able to achieve sentience in her current state? Hopefully Bernard will discover a way to restore her to normal. 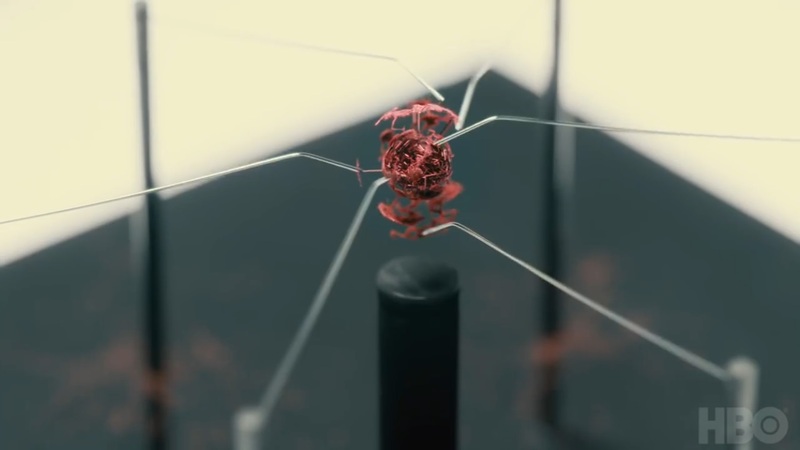 A couple of drone hosts working in a lab are met with a few unwanted human visitors. 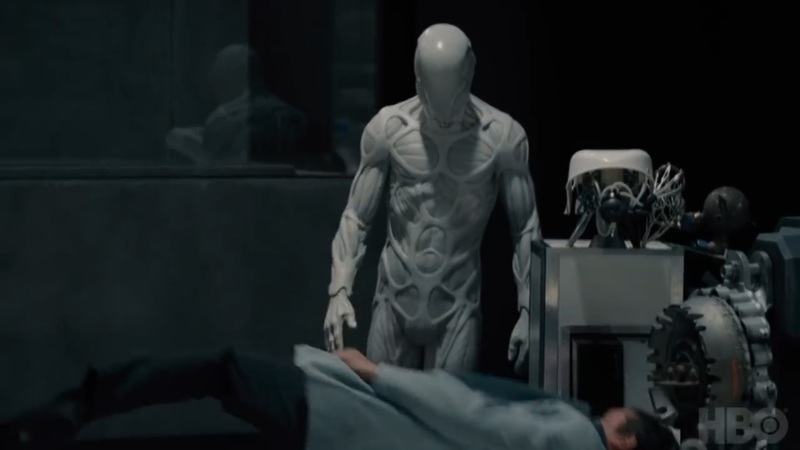 The creepy androids seem to make quick work of at least one of them, who is tossed into the white liquid used in making hosts. The drones could be part of Delos’ secret plan (for military/security use? ), along with the strange reddish orb being created. The orb looks like it could be the beginning of a robotic brain – maybe for manufacturing host versions of people whose consciousness could be uploaded into an immortal body? Time will tell. The Man in Black walks towards the entrance of an underground bunker, knife in hand, as we hear him say “I’m gonna burn this whole thing to the ground.” Could he be merely exacting revenge against the literal army of humans who have invaded his playground? Or perhaps – in an attack of conscience – he plans to expose Delos’ hidden agenda? 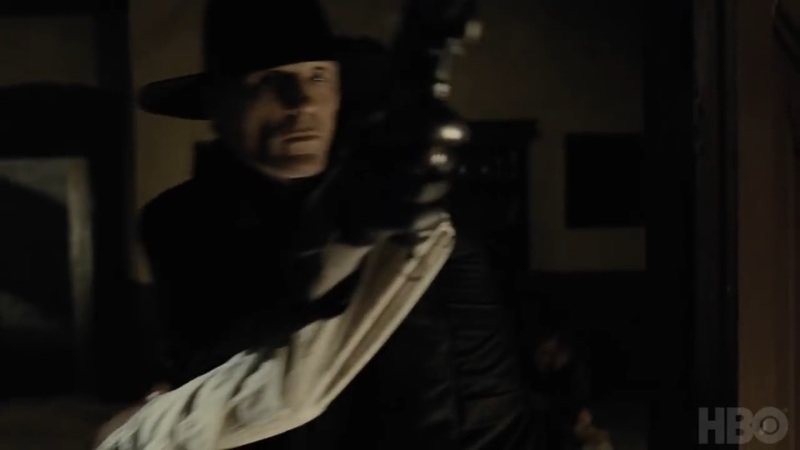 In this shot he holds up a body for cover and shoots at an ominous threat approaching in the rain. An armored figure walks through Shogun World. 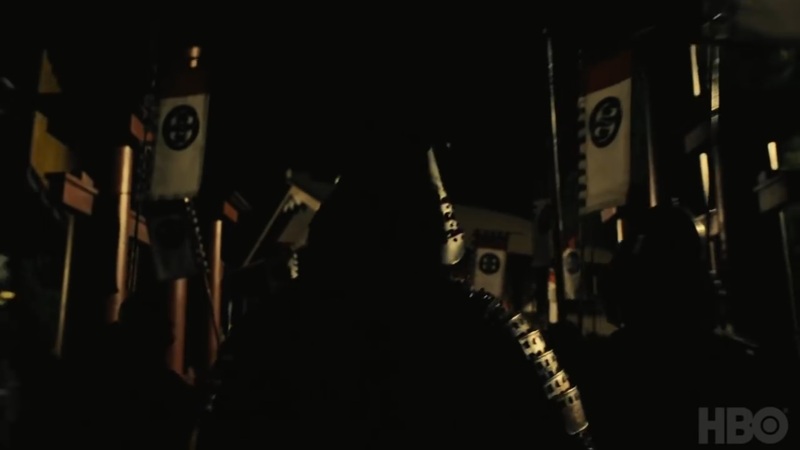 Could this be our first look at Musashi (Hiroyuki Sanada)? 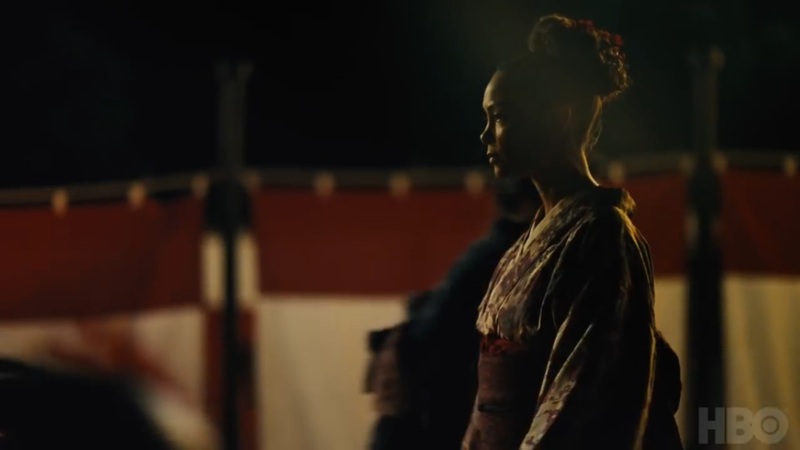 Maeve also finds herself in Shogun World wearing a kimono. Could she have infiltrated this park to find her daughter? We hear her say “They’re lost in the dark,” so maybe her goal is to wake these hosts as well? Here we see Angela in a very different setting from her last appearance. It looks like a shirtless Logan may be laying next to her in bed, while a couple of barely-dressed – people/hosts? – hang out on the floor. Looks like fun was definitely had, but does Angela have a larger goal in mind as she utilizes her powers of seduction? Or perhaps she is under the direction of the man who has crashed the party – probably William. It’s difficult to tell what’s happening here, but Teddy and Dolores could be debating their next move. 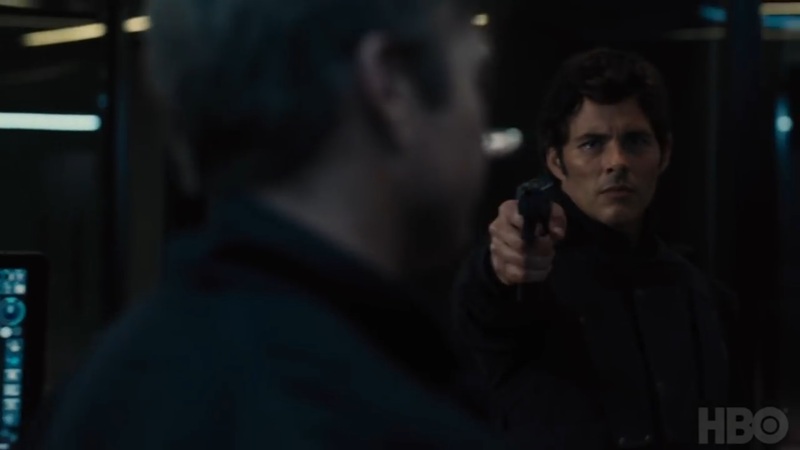 We then hear Dolores’ voice once again, as she says “I know exactly what is out there.” That suggest the next few shots of her are from the past – this one here could be her discovering something sinister in the Delos facility as young William, or perhaps James Delos, approaches. Since the humans assumed they could erase the hosts’ memories, they probably didn’t worry too much about what they saw. That has some intriguing implications for Dolores, who can presumably access all of those memories now. 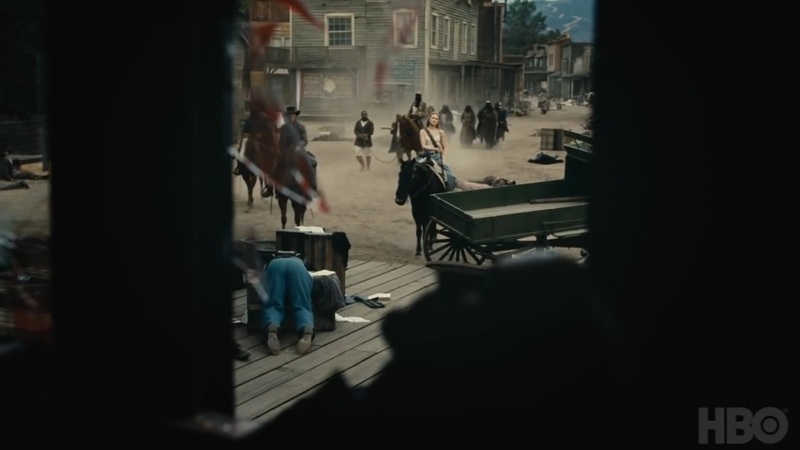 This could be Dolores outside of the park in the present, but it’s more likely a trip from the past. 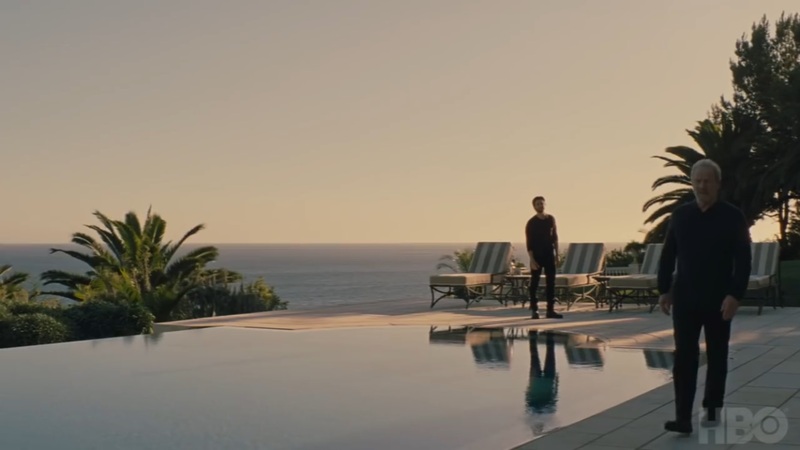 In an earlier trailer, we see hosts at a “mainland” party with Logan, and they are dressed similarly to Dolores here. Teddy seems to have disguised himself as security and infiltrated the Delos lab, as he holds Stubbs at gunpoint. 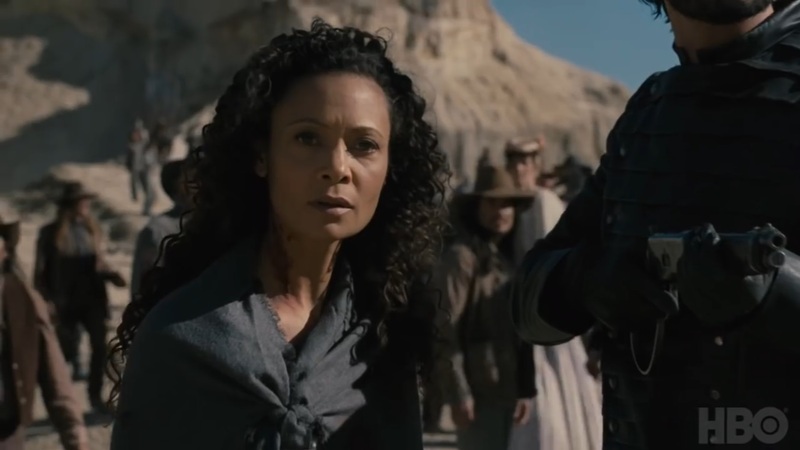 Here is another shot of Dolores from the past – either on the “mainland” again, or in a corporate or guest resort area of Westworld. She is dressed as a greeter host, so perhaps that was one of her roles in the early days of the park. It looks like Bernard’s cover as a human is blown, as Charlotte discovers a stash of Bernard hosts. 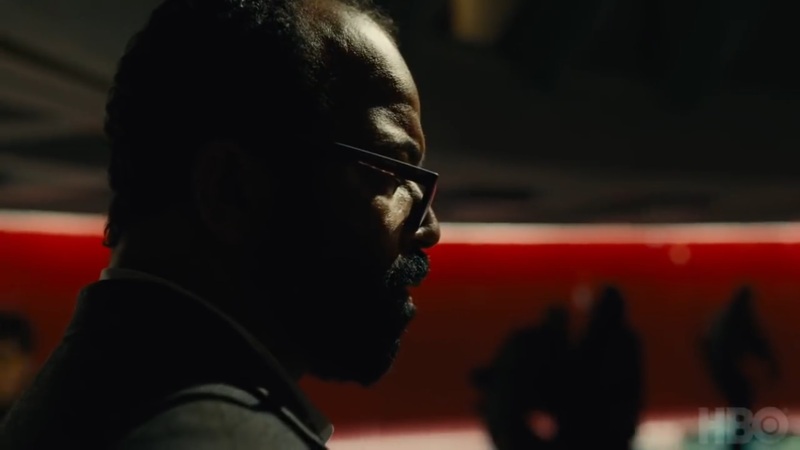 Presumably Dr. Ford kept spares on hand in the event Bernard was damaged or destroyed; it would be difficult to take him for repairs or rebuilds and keep his identity as a host a secret from Delos employees. Given the somewhat pleased look on Charlotte’s face, this could be very bad for Bernard – she may take control of his programming. 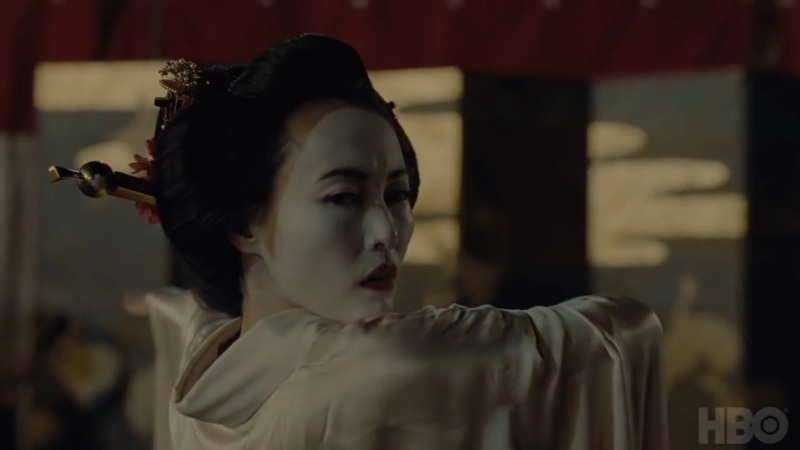 Next we see a geisha from Shogun World, who looks like she may be preparing to attack. Of course, she could just be dancing – surely not all the hosts are dangerous now…or are they? Who’s side is Bernard on here? Is this really Bernard, or one of the host copies? Did Charlotte program him to kill? 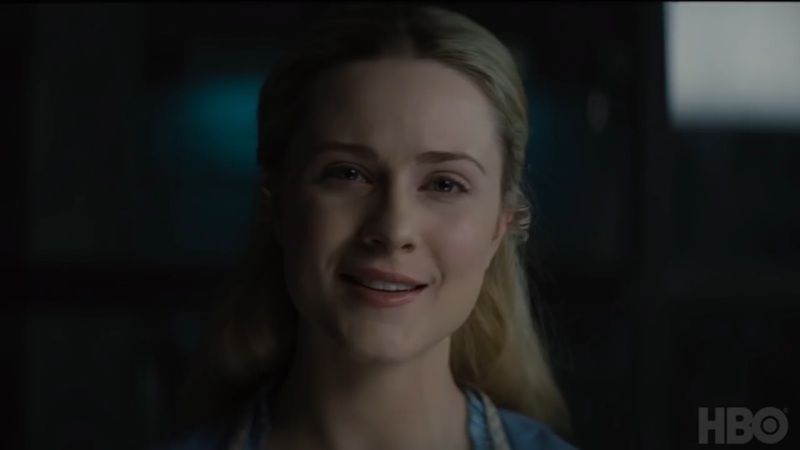 And Dolores, who laughs innocently when Arnold tells her “You frighten me sometimes Dolores,” responding “Why on earth would you ever be frightened of me?” I’m sure we will find out when Westworld returns on April 22nd. 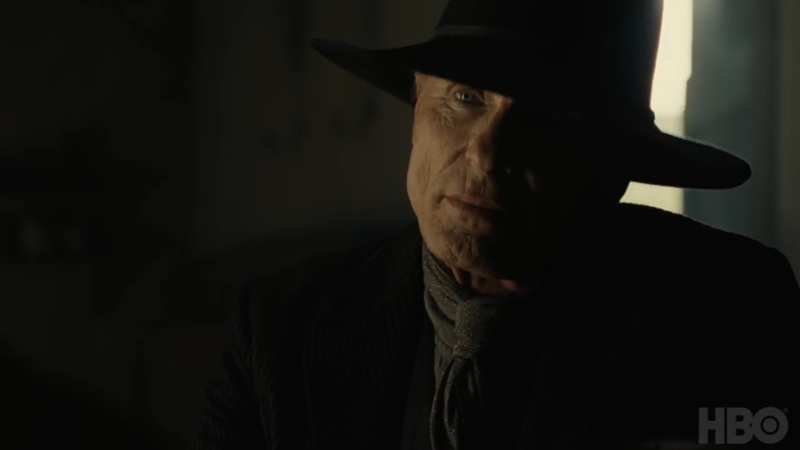 What did you think of the trailer Westworld fans? Catch anything we missed? Speculate away in the comments! Well bodies laying UNDER the train track was not what I had in mind. 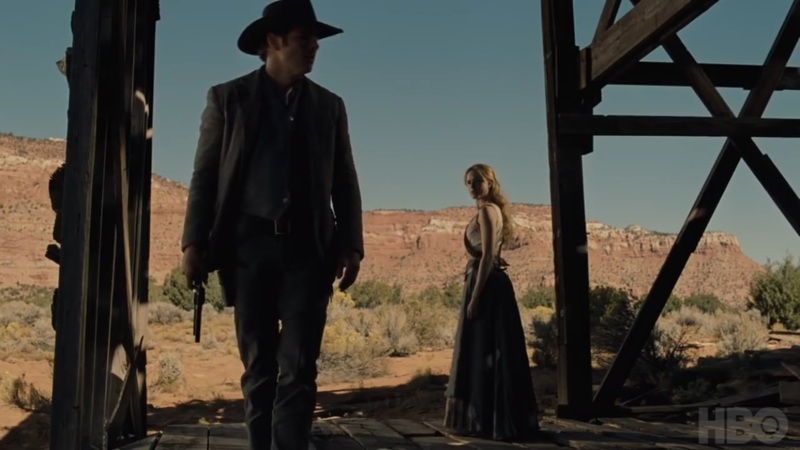 The photo of Dolores is NOT in Westworld at all but outside of Westworld, perhaps in New York since there are skyscrapers in the background. I found another site that had more Dolores photos in that white dress along with — with the young Logan, in a bedroom. She is also in that scene at a cocktail party – again the NY type skyline, but when all the people (hosts?) suddenly stopped and he didn’t. Apparently hosts are ALREADY out there in the real world! pretending to be REAL PEOPLE. Perhaps that is what Arnold and Delos had in mind – replacements. LIFE WITHOUT LIMITS….. I saw that. I’m guessing they will be adding information there as the season progresses. I definitely think they had replacements in mind. Thank you for the confirmation that those Dolores scenes were from the past ! If you’re looking for answers, it’s already too late. What’s done is done. You’ll find out soon enough. Journey into Night was a hit with the Delos board. Reservations will be opening soon…you’ll finally get to experience a new narrative where we choose our own adventure. 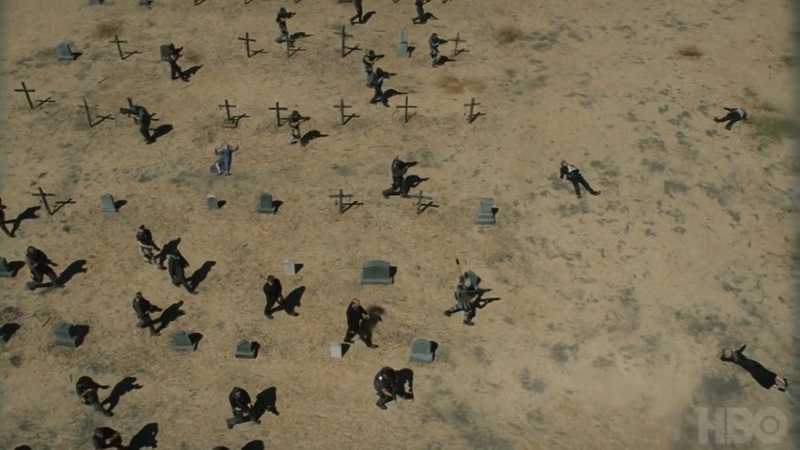 I think the scene where Dolores has the humans standing on the grave markers is probably a homage to “The Good, The Bad and The Ugly,” where Clint Eastwood’s character Blondie does the same to his “frenemy” Tuco – Tuco has a noose around his neck and is desperately trying to avoid falling off the gravestone and getting hanged. Blondie, however, [SPOILER!] eventually shows mercy; I very much doubt Dolores will! Teddy in the Delos security uniform and Maeve in Japanese costume both seem very interesting. As are the scenes of Dolores in the black dress – I wonder if this isn’t actually “present day” Dolores out in the human world? 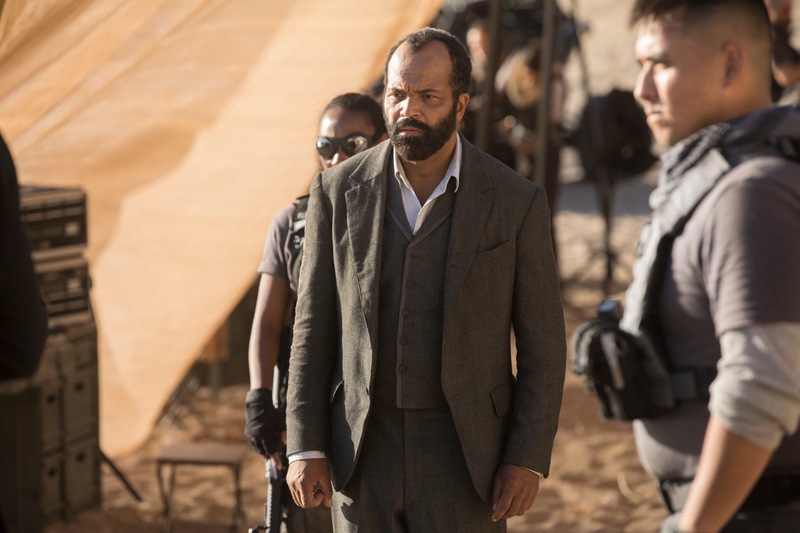 My theory, based on the hints dropped in cast interviews about S2 being very surprising in the direction it takes and not necessarily following straight on from the S1 finale, makes me wonder whether Karl Strand and his PMCs don’t succeed in taking back the park and suppressing the robot rebellion much more quickly than you might think…but then the relatively few, fully sentient escapees manage to fight back by infiltrating the human facilities (and in the case of Maeve, maybe kicking off a full-on samurai uprising in ShogunWorld). Aided, maybe, by the man in black, who doesn’t seem to be seeing eye to eye with his Delos colleagues? Excellent breakdown of the trailer; much more observant than I. 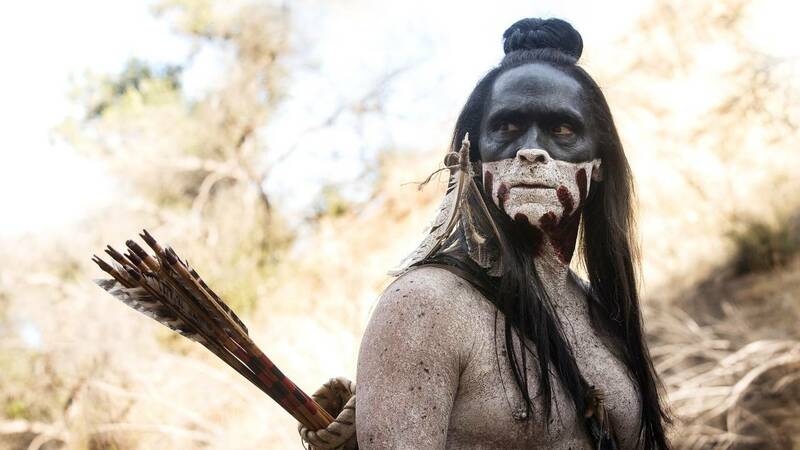 Can we tell if it is Zahn McClarnon that finds Logan? I am looking forward to the start of the season. Hoping that the writing for this season is not as dependent on the “big reveal” as it was last season. The trailers suggest that there is a lot of story to tell. I’m intrigued that we will not have a linear story line once again. The multiple Bernards strike me as very interesting indeed.Do we now need to go back to S1 and decide which Bernard/Arnold is in which scene? 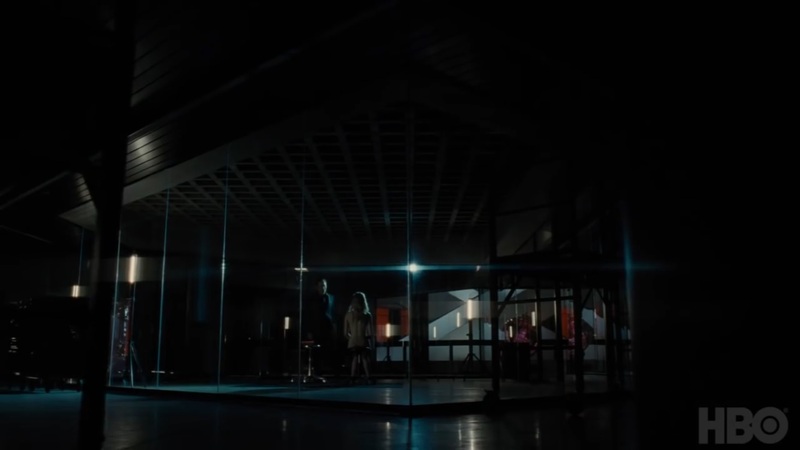 I’ve always assumed that the discussions between Dolores and Bernard/Arnold in the old basement (of the church?) were Arnold. 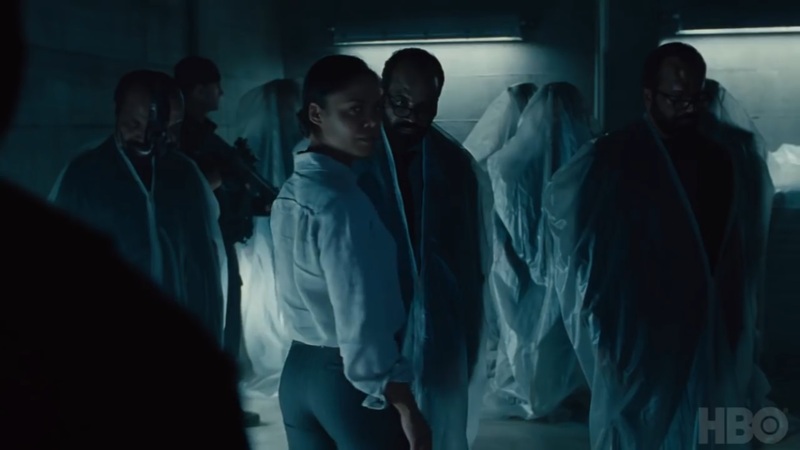 Based on the trailer and the knowledge that there are multiple Bernards, I suppose we could question whether they were used in S1 or whether Ford only had them on standby. Frankly, I was hoping to avoid some of that in S2. The finding of multiple Bernards in storage was supposedly in case Bernard got hurt somehow. Easier to instantly replace him than take time out fix him —-or explain to the others that think he’s real. I am now wondering if Dr Ford is actually Arnold all along. Making his own replacements as he is supposed to age. What hit me a lot is watching Dr Fords odd gestures with Bernard just before the dinner with the Delos board members. If he was truly killed then, was that a setup all along? They do have us running in circles !